Welcome to our January release! 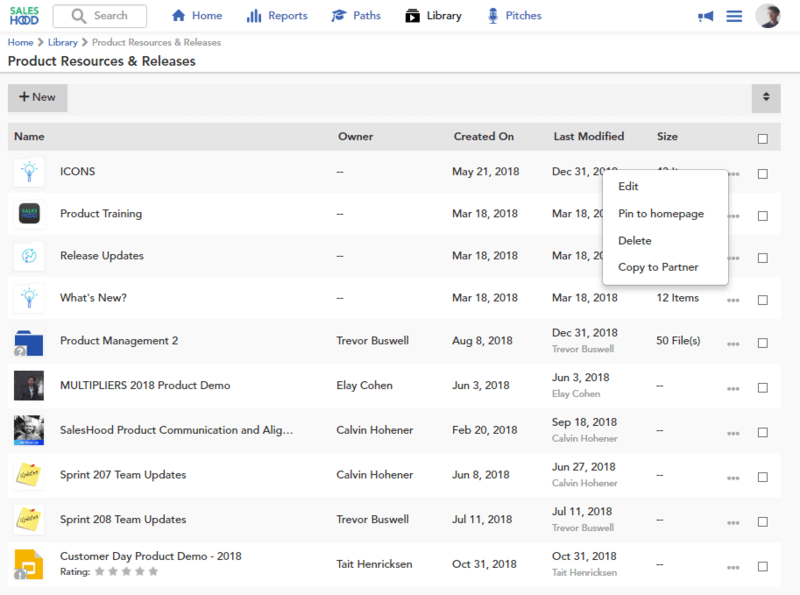 This release we focused on adding a new pitch module type into huddles, pinning files and categories to the homepage, and much more. Let’s get started! 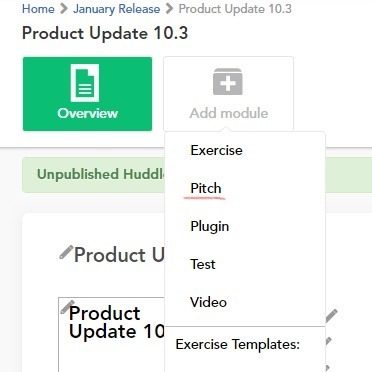 This release we have added a new module type into huddles called “Pitch”. We truly built this with your use cases and feedback in mind, thank you all for the help in building and growing the functionality. Below, you can see an example of a pitch module fully loaded with everything from video, leaderboard, and reviews. To start, you can add a pitch module, simply by going to the “Add Module” button when your huddle is unpublished and select the new “Pitch”. 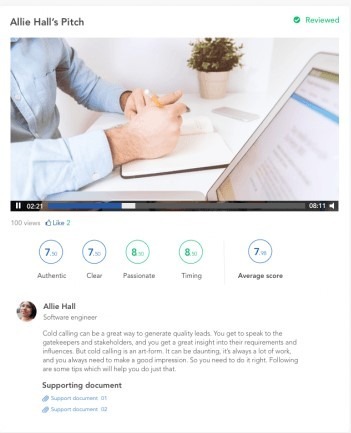 After your create the pitch module and publish the huddle, you will see 3 main components: Video, Review, Leaderboard. 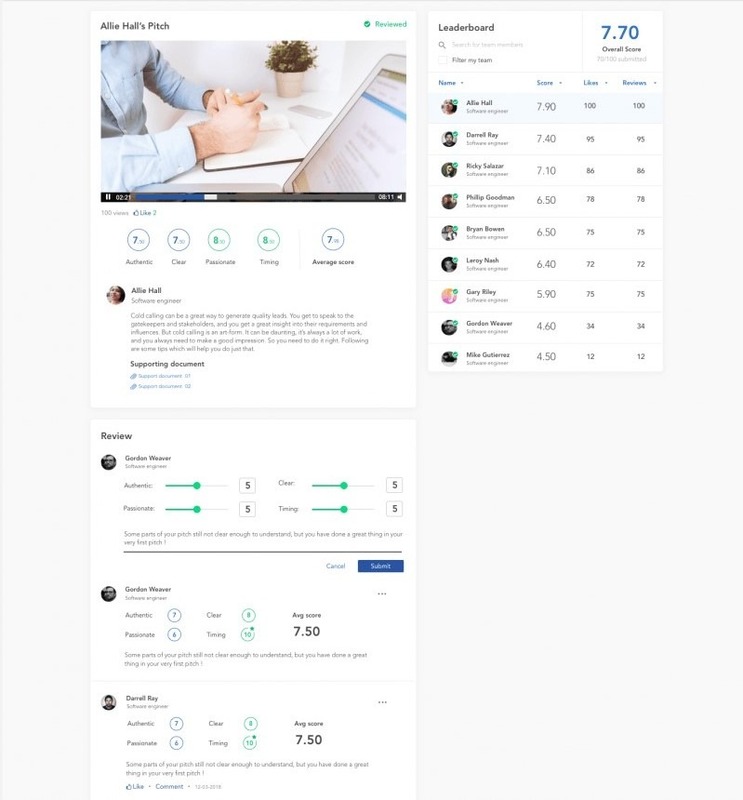 Here the user can record/upload/watch their pitch, view their scores, and add a description or supporting documents all in-line. These can be updated anytime by the participant and by any manager, publisher, or coach. 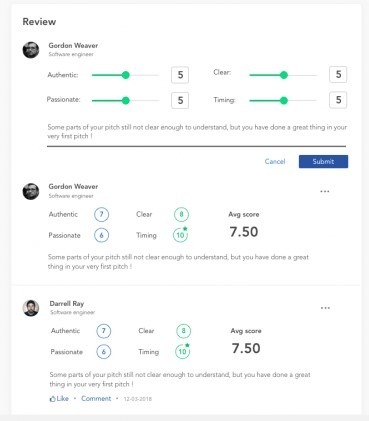 If the pitch module is in a scheduled huddle, the Host, Manager, and Coach cannot upload a pitch for themselves although can view, upload, and review all particpants. The review component is where a participant, coach, or manager can review the video based on the criteria set in the unpublished page. If there are no criteria for the video, only the ability to comment will be shown. In the review section, you can see the scores for each criterion, the average score of the criteria, and any given comment. After a review is submitted, an email and Coaching Activity is sent to the participant notifying them of who gave a score and comment (if any). You can also @mention people within your reviews to share the conversations to others! 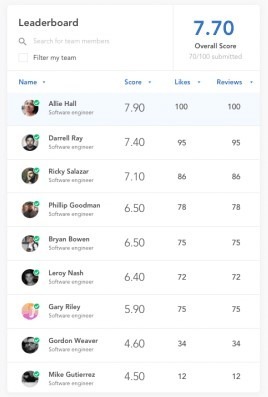 The leaderboard is where you can see all participants average score (average of each criterion if any), # of likes, and # of reviews with the ability to search and filter to your team. The “Overall Score” is the average of everyone’s score in the leaderboard, if the scorecard is turned off this will instead display % Submitted. You can select any participant in the leaderboard and go directly to their video to watch and review. Once you reviewed their video, a green checkmark will appear in the leaderboard to indicate who you have reviewed. Do you have a sales playbook, mutual plan, or company photo you want to share to the homepage? Now you can by pinning files and categories directly from the library to the homepage. To pin a file or category, simply go into the library and find the item you wish to pin. Once found, hover over the category or file then select the “…” ellipses. In the ellipses drop down, you should see “Pin to the homepage”, just select that and done! We improved our SalesForce Content App plugin even further with the ability for coaches to tag huddles directly in the huddle or Library. What does this mean? If you have huddles that are key to your organization’s sales process they will now surface just-in-time within the plugin. To tag a huddle, simply go to the “Overview” page of a published huddle and select “Manage Tags”. 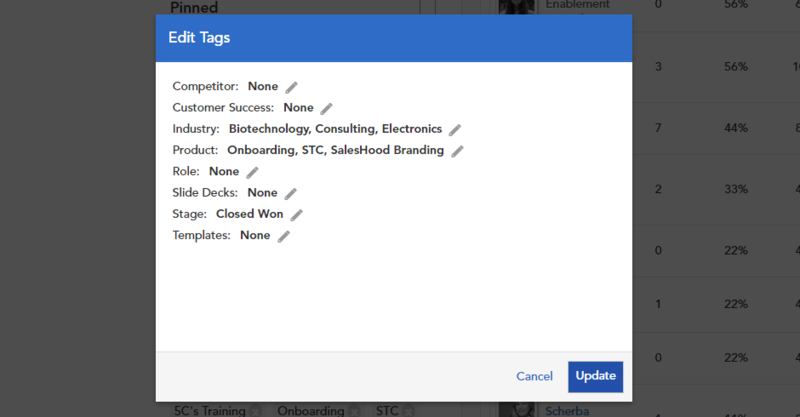 From “Manage Tags” a dialog box will appear with all your pre-created Tag Groups. If you do not have the SalesForce Content App plugin enabled or tagged, the dialog box will appear empty. Once you select the tags from the dialog then select “Update” then the huddle will appear in your SalesForce Content App plugin when the tags match. You can also do this from the Library by clicking on the “…” ellipses of a huddle then “Tag”. Note: For huddles to appear in your plugin, please update via AppExchange to the latest version. Running a scheduled huddle for people outside of your team? From your feedback, we added the ability to prevent your team from automatically being added when creating a scheduled huddle. “Auto-Assign your team” option is on by default and will automatically add your team into the scheduled huddle after creation. 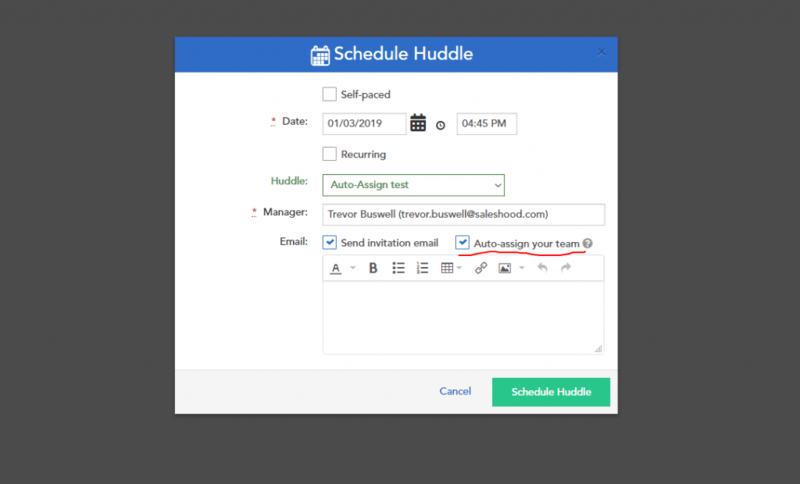 If you select the checkbox to off, your team will not be automatically added to the scheduled huddle after creation. This is only for scheduled huddles. Here is a sneak peak to what you can expect from the mobile release for the pitch module. Thanks for reading the release notes! If you have any questions or feedback, please email support@saleshood.com anytime.